Why Is It Called an Ordered Pair? 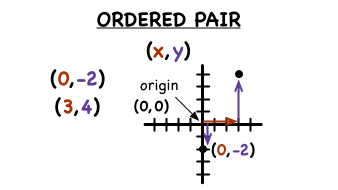 Why is an ordered pair called an ordered pair? Because order is important! If an ordered pair is written in a different order, it makes a different ordered pair. This tutorial shows you why order is important when you're dealing with ordered pairs. Graphing a function? It would be really helpful if you had a table of values that fit your equation. You could plot those values on a coordinate plane and connect the point to make your graph. See it all in this tutorial!